The potd will give you another peek at our house. From the previous peek you could see we have a beautiful porch on the front. 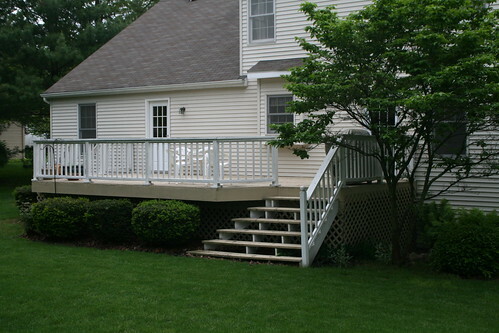 We also have a great deck off the back. I think we'll end up using it a lot. We had family over for Mattey's birthday this afternoon. I thought we'd hang out on the deck but I never made it out there until it was time to clean up. It had cooled down by that time. It was kind of muggy and warm today. The kids enjoyed the yard and ate on the deck but the adults stayed in for the most part. I think we need to get some comfy and inviting furniture. If you see a good deal on a set of table and chairs let us know. Maybe a swing or glider too. Wow-that is beautiful. What a perfect place to hold a party!